Admission Prospectus for B.Sc.(Hons.) Milk Production Management. Over Journey 54 years of Dudhsagar Dairy and 48 years of Dudhsagar Research and Development Association, Needs arise for addressing Village cooperative & Animal Health level. To strengthen the milk business improvement in per animal milk productivity. For sustainable dairy business attachment of milk producers and Profit in the business should be increased. Kankuba Pashupalan Vidyapith established under the Edges of Dudhsagar Research and Development Association Sister Organization Dudhsagar Dairy) in the year 2015-16 . Kankuba Pashupalan Vidyapith is offering B.Sc.(Hons.) 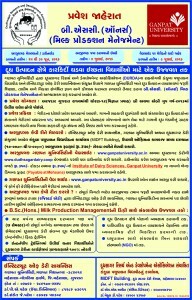 Milk Production Management Degree course Jointly with Institute of Dairy Sciences, Ganpat University, Kherva, Mehsana. To implement the approach of Cooperation, Scientific and Commercial talent in Milk Business. very crucial & essential step for future development. To Provide Graduate level skilled man force for cooperative management like cooperative laws, Accounting, Auditing, Meetings etc. To Provide Graduate level skilled man force for Preventive & Animal Health works like Vaccination, Deworming, Mastitis Control, CalfRearing Programme and Ration balancing Programme etc. To Provide Graduate level skilled man forces which can directly interact/assist with milk producers for Dairy Union’s and governmentsvarious subsidy and Projects. Training of the farmers, Milk Producers for Fodder Crop Production. To educate the student and milk producers for modern farm practices. To educate the student and milk producers for recent developing advancement in animal health and milk business.